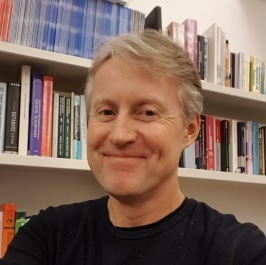 I was the Founding Editor-in-Chief of the IEEE Transactions on Computational Intelligence and AI in Games, and also co-founded the IEEE Conference on Computational Intelligence and Games, first held at the University of Essex in 2005. I am the Vice President for Education of the IEEE Computational Intelligence Society; here is my vision statement. I was educated at Bedwas High School, University of Kent (BSc in Computer Systems Engineering) and University of Southampton (PhD in Electronics and Computer Science). Between BSc and PhD I worked for GEC Avionics, in a software test group for their world leading Head-Up Displays, then in the flight automation research lab research lab hacking LISP. My PhD (1991) was on Connectionist Architectures for Syntactic Pattern Recognition, one of the early PhDs on Deep Neural Networks, under the excellent supervision of Professor Bob Damper. On completing my PhD I was post-doctoral research fellow at Southampton for one year and was then appointed as a Lecturer in Electronic Systems Engineering at Essex. My early research was mostly focused on Pattern Recognition, and I have pioneered novel variations of N-Tuple classifiers (Scanning, Continuous and Convolutional), the best classifier that no-one has ever heard of! Over the last decade or two my research has gravitated toward Game AI: games provide an ideal arena for AI research, and also make an excellent application area. See publications for details.